Mistletoe is a hemi-parasitic plant that absorbs nutrients from a benign host whose only desire is to furnish her home with Holiday Spirit and Good Cheer, but all she REALLY gets in return are sawed-off moochers and bitter crying jags. Is that why people kiss under the mistletoe? To mimick sucking the life force out of another living thing? Holy moley, Christmas is harsh. I have an ambivalent view of Christmas. I try to find the funny through a darkish lens. I'm waiting for a rebuttal from poinsettia. 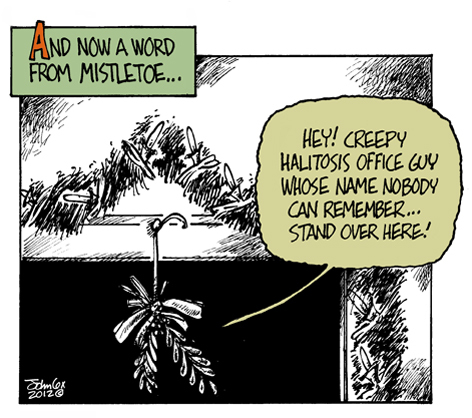 Mistletoe's malevolent effects seem to be in direct proportion to the amount and strength of adult beverages available. This page contains a single entry from the blog posted on December 19, 2012 6:16 PM. The previous post in this blog was "Tis The Season. The next post in this blog is Non Compost Mentis.